I love metal roofs – they really stand the test of time. Think of those old barns and farmhouses with metal roofs, still holding up centuries later. Some copper roofs on churches and government buildings are over 500 years old – even high-grade asphalt shingles will only give you a 30 year guarantee. Yes, they are more expensive – a metal roof will definitely cost you more than an asphalt shingle roof – but they’re still less expensive than slate, tile or cedar shake. And they will last a lot longer. 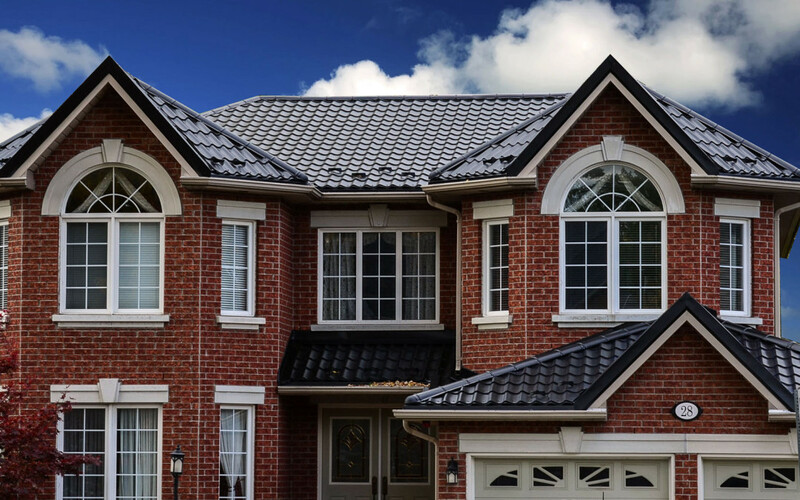 A metal roof should last at least two- to three times longer than a regular asphalt shingle roof – an average of 50 years or more, where the average lifespan of an asphalt roof is 15 to 20 years. Which makes sense, since asphalt shingles are typically made of paper or fiberglass impregnated with oil and coated with fine gravel. They begin to break down as soon as you expose them to weather. Asphalt shingles and cedar shakes are easy to tear off – and creatures like squirrels and raccoons have no problem getting into your attic. A metal roof is inorganic and will never decompose. It resists insects, mildew, and rot, and metal roofs won’t curl or crack like asphalt, and they are resistant to ultra-violet light, which also acts to break down asphalt shingles. Metal roofs can also withstand extremely high winds – whereas asphalt shingles have been known to tear off and blow away. The most important reason I like metal roofs is because they are fire resistant. If a fire breaks out next door and sparks or embers blow from that roof to the neighboring house’s roof, the fire will spread. But a metal roof won’t catch fire. It’s non-combustible and Class A fire rated. Since metal doesn’t absorb moisture, its weight stays the same in both dry and wet weather. Cedar shake will weigh more when its wet, and both clay and concrete tiles are porous and will retain a lot of moisture – up to 10 pounds per square foot. You’ll need to provide extra support for this weight load. Most metal is almost 100 percent recyclable, which makes it very environmentally friendly. And most new metal roofs are made with the partly-recycled material. And, since metal roofs last much longer, they need replacing less often, which keeps tons of used roofing material out of our landfills. You would not believe the amount of waste that comes with the tear-off and disposal of an old roof – let alone the cost to you as a homeowner. And, by the way, about that old roof: You’ll hear a lot of people suggest that because metal roofs are so lightweight, you can put them over old asphalt shingles to save the expense of tearing off the old roof – and save the landfill charges. They may even play the environmental card and tell you that it’s a good idea to keep the old shingles on and go over them. Don’t do it. I always recommend you tear off old shingles and inspect your roof deck before reshingling, even with a lightweight metal roof. A lot of people worry that their metal roofs will be noisy when it rains – like living inside a drum. But a properly installed metal roof is no louder than any other roof. If the metal shingles have been mounted properly by a professional using built-up two-by-four strapping to help with venting and breathability or over an attic space that is well-insulated, the noise is controlled. Mike Holmes is the host of Holmes on Homes on HGTV. E-mail Mike at mikeholmes@holmesonhomes.com or go to www.holmesonhomes.com.